No one deserves lung cancer: Smoker, non-smoker or never smoker. It shouldn’t matter. One look, a movement and a comment: Are you a smoker? Did you ever smoke? Sometimes the look says it all, or the physical recoil. That’s all it takes to feel that you deserve to have lung cancer. 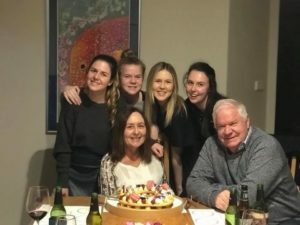 John is a husband, a father, he’s a good bloke … but he doesn’t tell people he has lung cancer because 1 in 3 Australians believe he deserves what he’s got. My sister Mandy is a non-smoker. Like many of us she smoked socially in the 80s. But she hasn’t smoked for over 30 years. Does she deserve to have lung cancer? Then there are the never smokers like me. My name is Carolyn and I am a loved wife and mother of 4 beautiful daughters. I didn’t think it was possible for me to get lung cancer. I had never smoked and my exposure to passive smoke was minimal. As a Japanese language high school teacher there was no occupational exposure. Yet in 2018, the impossible became possible. If you have lungs you can get lung cancer. All I ever had was a dry cough. I went many times to the doctor and had an initial clear chest x-ray but the cough continued. GPs see patients with coughs every day. How do they tell which of their patients have lung cancer? They certainly don’t expect never smokers who present with a cough to have lung canc er. So lung cancer is often diagnosed late. There is also no routine screening in Australia for early detection. Hard to fathom really when lung cancer kills more people than breast, prostate and ovarian cancer combined. I was the diagnosed the week of Mother’s Day. The doctor gently delivered the 3 words that would change my life: metastatic lung cancer. I shook my head in disbelief and my husband cried. And we still had to find a way to tell our 4 daughters. We had a diagnosis but no treatment option – that was to come so in the meantime we all independently turned to Dr Google. 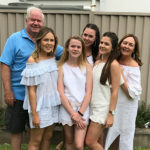 Unbeknown to me my beautiful girls were all desperately searching for information on lung cancer and finding horrifying statistics. The 1-year survival rate for Stage IV lung cancer is 55%. The 5-year survival rate is just 17%. Mother’s Day was tragically beautiful. My daughters’ thought it was to be my last so made it extra special – it had all the trimmings. We took lots of photos and we tried to be normal while ‘inside’ we were all absolutely terrified. Lung cancer has one of the lowest survival rates of any cancer in Australia. I did eventually access a Clinical Nurse Specialist but it was 2 months later and of my own volition. 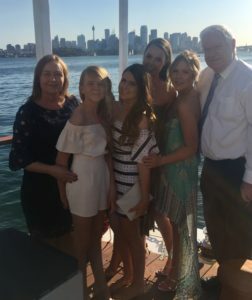 If only I had known how to access the CNS earlier, it would have made such a difference to help me and my family navigate a lung cancer diagnosis. The standard of care is not chemotherapy or immunotherapy, it is a targeted therapy. It is 1 tablet/day with, for me, manageable side effects. This drug can extend my life by shrinking the tumours – awesome. But the rub is that it doesn’t work forever. I know this treatment on average will work for only 10 months. I am so hopeful that I am better than average because this treatment allows me to work, take care of my family and enjoy life. It gives me a quality of life. On my last visit to my oncologist because I was responding so well he conservatively suggested a four-year survival instead of three – how my reality has changed. But what happens when this targeted therapy stops working? Hopefully I should qualify for a trial from Australian Lung Cancer Trials Group. But then without money going into lung cancer research what options will I have? When my 16 year old asked me if I would still be alive when she graduates university and the 5-year survival rate for lung cancer is only 17 % how do you answer that? But lung cancer is different. There is no cure. There is no remission; at best there is progression free survival. And yet I am hopeful. The lung cancer landscape has the impetus for change. I believe that stigma can be changed and I believe in the Australian ethos of the ‘fair go’. More money needs to go into research to give people with lung cancer a ‘fighting chance’. And we can make that happen. It is just a matter of changing how we think. The National Tobacco campaign has done an exceptional job to encourage and support people to quit smoking with its hard hitting anti-smoking ads but the stigma it has created has never been addressed. Many of the smokers with lung cancer started in an era when it was socially acceptable to smoke. And let’s not forget that smoking is an addiction. We need to show some kindness, some empathy, some compassion. So little funding goes towards lung cancer research and this needs to change. Stigma affects decisions into where money for research goes, both consciously and subconsciously.